We had a beautiful day today on board the Aurora for the 12:00 whale watch. The seas were calm, under 2 feet, bright clear skies and we had great visibility on the southwest corner. We spotted a few scattered blows throughout our trip but most of the whales were subsurface feeding and acting elusive. We started on Measles, who was taking about 3-4 minute dive times with about three breaths per surfacing. 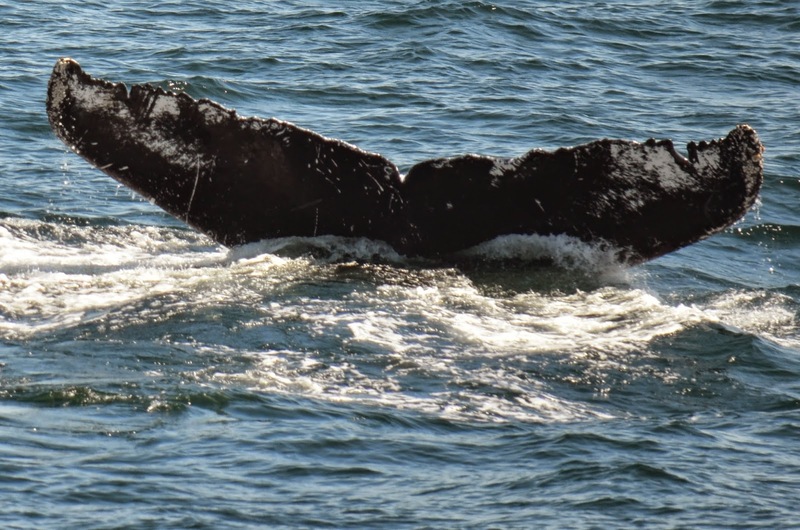 Then we moved on to a second whale that was seen about a short distance away closer to Provincetown. This whale turned out to be Valley, a female whale that is a new sighting for this season! Valley is a female whale who is easily identified by her lack of a dorsal fin, and who had a calf last season. She was traveling and subsurface feeding alone today, but did make one singe bubble cloud. She did not come up open mouth but it was clear she utilized this bubble cloud, as opposed to rejecting it. We watched Valley for a while and saw a few other blows in the area. On our way back to Boston, we spotted a fin whale about 5 miles from Minots Light but were far enough away so we didn’t stop. It was a very peaceful and sunny day on Stellwagen today, I am excited to add Valley as a new whale to our sightings list! We had a fin-tastic day out on Stellwagen Bank! We started with a brief look at an elusive fin whale near the southwest corner. We continued on and found several humpback whales on the southwest corner. We first spotted our old friend, Measles who was soon joined by a new whale for us, Valley, an old Stellwagen favorite. 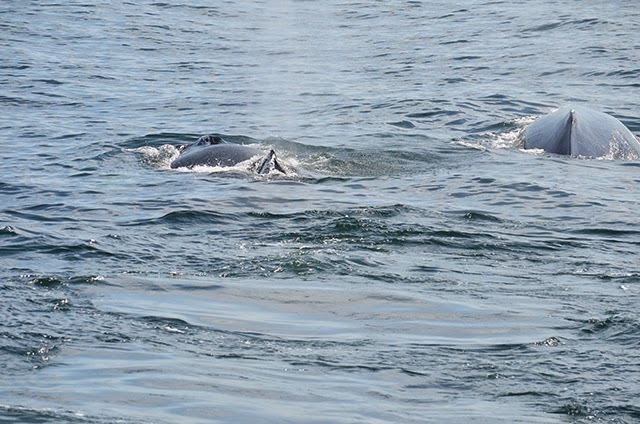 These two whales were likely feeding below the surface, blowing green clouds of bubbles that they would surface in, even some surface open mouth feeding! Valley is an unusual whale because at some point in her more than 29 years she has lost her dorsal fin and just has a smooth hump where other whales have a more distinct dorsal fin. This made telling the two whales apart a piece of cake! While we were watching these two amazing animals, our intern on board, Lindsey spotted something else. 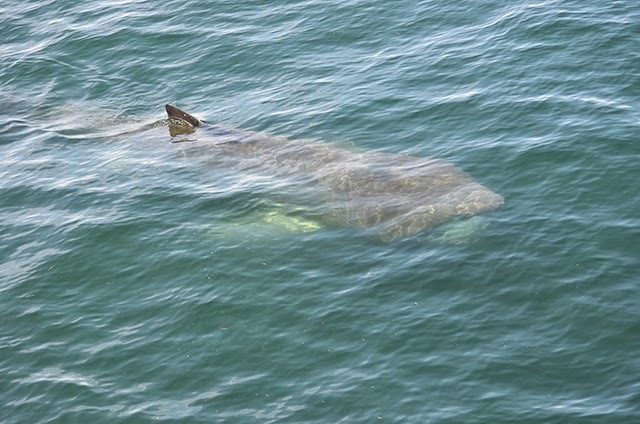 The calm sea conditions allowed us to have a spectacular encounter with a basking shark. Basking sharks are the second largest fish in the ocean, only smaller a whale shark, reaching lengths of us to 26 feet! These giants of the ocean feed entirely on plankton that they filter out of the water through a process reminiscent of baleen whales. For everyone on board it was a special moment. We also spotted several Cory’s shearwaters during today’s trip.